In 2002, Weihai Kaer Sonic Power Co., Ltd. is the first oringinal created “7 Heads Portal Frame Type Geocell Ultrasonic Welding Production Line” in domestic, in 2004, Kaer Sonic improved and designed “Non-portal Frame Semi-rigidity Geocell Ultrasonic Welding Production Line ”according to feedback from customers, in 2008, Kaer Sonic is again first oringinal designed and manufactured the Third Generation “High-efficient and Full-rigidity Building Block Type 36 Heads Geocell Ultrasonic Welding Production Line”. 1. High-efficient output: The maximum output of 24 hours could reach to 30000 m2, monthly output could reach to 900000 m2. 2. Good welding strength: Adopts the third generation full-rigidity building block structure, compared with the first generation longspan portal frame and second generation cantilever and semi-rigidity structure, the equipment’s rigidity is higher and no dynamic deformed, guarantee the welding strength and stability. At the same time, the equipment’s life time is increased substantially and reduce failure rate. 3. Adjust the pitch conveniently: the welding pitch can be adjusted within 320~800mm freely, conveniently and easily. 4. 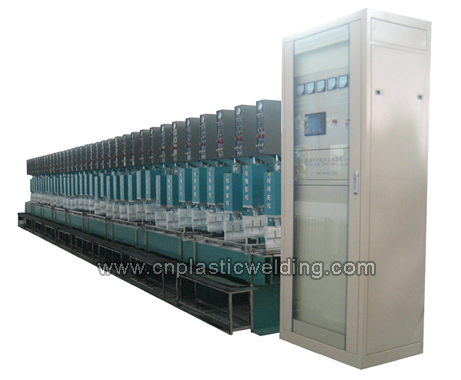 Possess the automatic diagnosis function of welding strength and equipment failure: adopt the computer scan technology, can dynamic monitor each units’ working condition, and found the failure and poor welding without delay (operator can use the single machine for repairing welding). 5. Operating safety: double-link power switch, possess the low air pressure protection and unexpected power-off protection system, it ensures human and equipment safety. 6. Save labor and conveniently: stainless steel bracket for strips feeding, easy to operate, save time and high efficiency. 7. Turn-key project: provide customer with the overall plant arrangement, air source system, electric distribution system, installation and debugging and training in field and all of the soft and hard ware service, ensure customer can put into production rapidly and smoothly. 6) When width of strip less than half of max. geocell height, the 2 strips can be welded at the same time, efficiency is double. Some Application Examples:We also provide half-finished goods and finished good of geocell strips.